You are viewing this Brand New Officially Licensed NFL Football Fan Apparel Item. 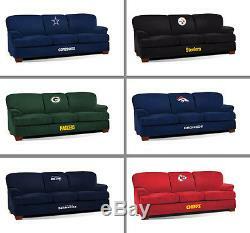 Choose Your NFL Football Team Premium First Team Soft Microfiber Sofa. Relax and sit comfortably while supporting your Team with this Solid Team Color Polyester Microfiber Sofa with Embroidered Logos by Imperial. (Item is Made to Order). Show some pride and support of your favorite NFL Team while relaxing and sitting comfortably with this First Team Soft Microfiber Sofa! Use drop-down box above to choose from available Teams and view image! This First Team Sofa is custom made by Imperial International which is the perfect addition to any game room, sports man cave, den, or living room. The Premium First Team Sofa is a sporty and contemporary designed Microfiber Sofa made especially for the die hard fan who wants to show their team spirit. Made of high quality furniture grade Solid Team Color Soft Polyester Microfiber Fabric all over the sofa with Thick Padded Seat, Back, and Arm Rest Cushions for maximum support and comfort! Feature's your favorite Team's Embroidered Patch Color Logo and Name sewn on both the center cushion at the top and the bottom frame base! The First Team Sofa actually replaces the retired Pub Sofa and features a brand new look; as it is a little longer, a little deeper and a little taller! Sofa Frame made of high quality wood with thick hardwood blocked corners, super-loop solid steel no-sag seat springs, and compression foam. Seat cushions and sides filled with premium high density compression foam for durability and comfort. Back support cushions filled with premium polyester fill fiber for softness, fullness, and resiliency. This couch provides an incredibly comfy place to sit, relax, and watch the big game with family and friends. Fabric is treated with Teflon for built in stain resistance and durability. First Team Sofa Size Dimensions: 91" (L) x 39" (W) x 37 (H). Sit back and relax comfortably with this stylish full-length sofa by Imperial. A must have for any fan, so be the first on the block to have one of these babies! High quality polyester microfiber fabric with knitted back. Easy to maintain and clean as it is water washable. Sofa weighs approximately 147 lbs. Custom made in the USA. Officially Licensed by the NFL. Due to this item being custom made to order, orders can not be canceled or changed once production begins. Imperial International History: Imperial started in 1934 as H.
Betti Industries, which by the mid 1970's, they had become Imperial Billiards, and during mid 80's, Imperial Billiards became "Imperial International". Since that time, they have grown to provide a huge assortment of game room products, billiard tables, and accessories. With many warehouses and main offices located throughout the US and on each coast; this gives them regional accessibility to service customers both in the U. Imperial's desire to provide high quality products at a reasonable cost remains one of their top priorities! When decorating your game room, choosing an Imperial product will be a great choice since they are one of our leading suppliers of recreational room decor. Product Size: 91" (L) x 39" (W) x 37 (H) Product Color: Team Colors Product Material: Polyester Microfiber Fabric, Wood, Metal, & Foam. Customize your game room with high quality products at a reasonable cost! NFL SHOP AT LORRINA'S HOT DEALS. BEST PRICES ON THE NET - BLOW OUT SALE - WHOLESALE PRICING. Visit Our Other Store Items at Lorrina's Hot Deals. Meaning, it is left somewhere on your property outside or in the garage. PROFESSIONAL INSTALLATION: Certain products are offered with optional professional installation which we will indicate this on the product page. Thank you for your time and business! When your replacement product(s) are reshipped to you, there is no extra cost to you and a return call tag label will be provided for returning the damaged or defective item. We want your shopping experience with us to be a "5 STAR" experience. Once your item(s) arrive, please make sure that your order is correct, intact, and complete. Upon doing this, you will also be able to rate on a scale of 1 - 5 in the four categories. We will make every effort to make your experience top notch! Powered by SixBit's eCommerce Solution. The item "Choose Your NFL Team Premium First Team Soft Microfiber Sofa by Imperial" is in sale since Thursday, May 07, 2015. This item is in the category "Sports Mem, Cards & Fan Shop\Fan Apparel & Souvenirs\Football-NFL". The seller is "lorrinashotdeals" and is located in Carlstadt, New Jersey. This item can be shipped to United States.